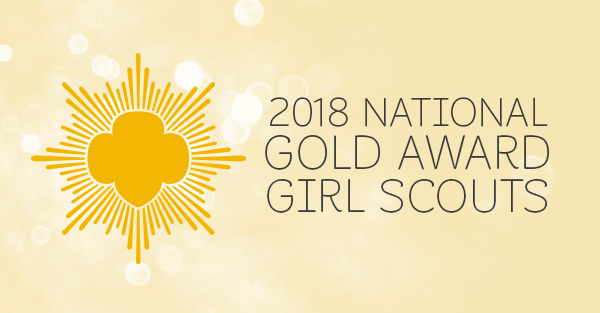 From creating comprehensive, age-appropriate mental health programs to fighting against human trafficking and child marriage, this year's National Gold Award Girl Scouts are creating positive changes to address society's most pressing issues. They exemplify how Girl Scouts confidently stand up for what they believe in, advocate for causes, and take action to solve community problems, showcasing Girl Scouts’ commitment to civic engagement. “Our 2018 National Gold Award Girl Scouts demonstrate how girls are creating positive, sustainable change to improve their communities and the world,” said GSUSA CEO Sylvia Acevedo. “With their incredible aspirations, innovative problem solving, and risk-taking spirit, these girls are exactly the kind of employees 21st-century companies are looking for. They are well on their way to becoming the business leaders, activists, scientists, entrepreneurs, policymakers, and artists who will build our collective future." Being named a National Gold Award Girl Scout, becoming a Gold Award Girl Scout, and receiving generous scholarships are just a few of the countless experiences girls have through Girl Scouts. To join or learn about volunteering, visit www.girlscouts.org/join.